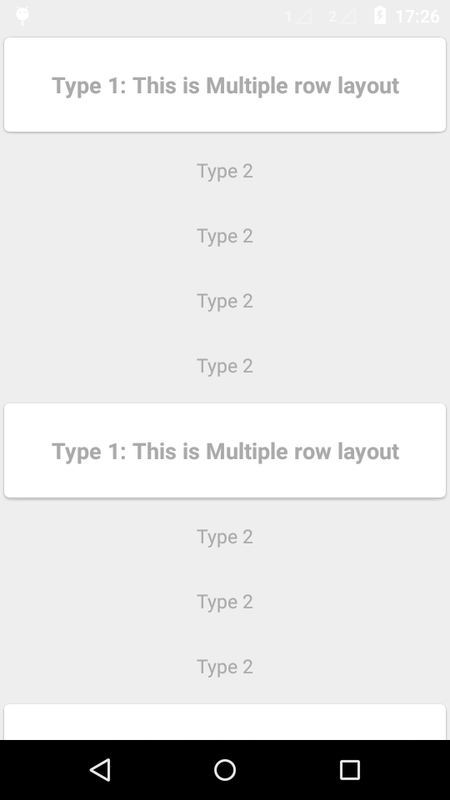 Description: In this post I'm gonna show you how we can have multiple row layout in Android's Material Design RecyclerView using getItemViewType. Step 1: Create Recycler Adapter by overriding getItemViewType method and giving the type for different layout as shown below. Step 2: Create a viewHolder as per viewType . 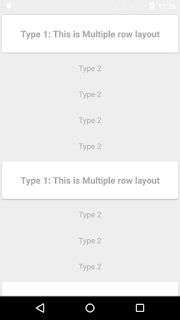 We can create different row layout using viewType . Note: viewType in onCreateviewholder is retured from getItemViewType in Step 1. 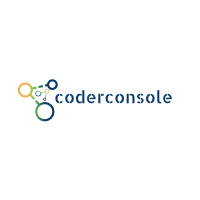 Step 3: Lets integrated all this in one RecyclerView adapter. Step 4: Finally our MainActivity looks something like this.